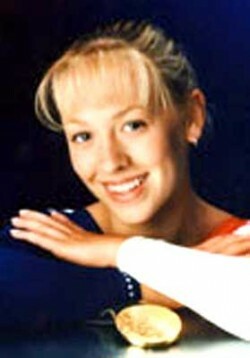 Jaycie Phelps was a member of the famous “Magnificent Seven,” and in 1996, was named Sportsperson of the Year. Her accomplishments landed her a spot on the Wheaties box and later had a street named after her in Cincinnati , called Jaycie Phelps Drive . Phelps was a three-time World Championships team member. After helping the U.S. team win a bronze medal at the 1995 World Championships, Jaycie was honored with the Sagamore of the Wabash award, the highest award an Indiana citizen can receive. Jaycie was also a member of the silver medal-winning World Championships team in 1994 and competed in the 1996 Individual Event World Championships in San Juan , Puerto Rico . Jaycie currently coaches at Colorado Aerials in Colorado Springs and is engaged to Brett McClure, a member of the silver medal-winning U.S. team at the 2001 Worlds. The couple hopes to be married after the 2004 Olympics.